Sandy Nelson was the senior graphic designer at Starbucks from 1997-2011. Today, she works as a freelancer with her own practice, Sandy Nelson Design. We spoke with her for our Industry Insights series about her time with Starbucks, and how it felt to be leading the charge for such a visible and influential company. How did your time at Starbucks shape the kind of designer that you are today? My time as a graphic designer at Starbucks profoundly shaped my skills and experience as a designer, especially because we were free to use illustration in our designs and experiment with different techniques. They valued art done by hand, which gave the work a very personal touch. We were fortunate to be assigned all kinds of projects so that we developed expertise in a wide variety of formats. You could be working on very small Starbucks coffee stamps and Starbucks Cards, and before you knew it, your next project was a wall-sized custom mural. We also worked on coffee packaging and custom packaged foods, in-store campaigns (which usually included posters, banners and t-shirts), CD packaging, and merchandise (including coffee mugs and tumbler designs). This broad experience kept the work interesting and exciting and gave me experience in conceptualizing and executing any printed piece, no matter the size or scope. In your tenure at Starbucks, when did you see some of the biggest shifts in the company’s design direction? The design direction evolved organically from the point when they brought the design work in-house in 1997 — when I started with the original 10 designers — to about 2010 when there was a movement to update the logo. We were certain that the logo would never change! But then an outside agency, which had been hired to produce some out-of-home advertising, suggested that it was time to modernize and simplify the branding. They convinced senior leadership that the inside mermaid image (the green of the original logo) could be a stand-alone Starbucks logo since the brand was so well known by then. I now concur that they were correct in that assessment. From that branding exercise, the outcome was that the illustration and design style should evolve too, to a more flat-color, modern look. While the new logo was well received, many people, myself included, thought that the new direction was generic-looking visually, and that some part of the ‘soul’ of the company had been lost. That new style lasted about a year and then gradually, the style evolved back into a more custom, artful look. At that point, Starbucks realized that their own in-house artists were the best assets that they had and started to call out the names of the designers responsible for the art. That was a momentous occasion, as it put a name to the high-quality work coming out of the creative studio. What was the most exciting and/or fulfilling project you worked on at Starbucks? I have a few, actually! I was assigned to redesign the coffee stamp / identity for Caffè Verona coffee in 2001. Caffè Verona is described as the “coffee of romance,” and I was directed to evoke romance and old Italy in my designs. One of my ideas involved creating an image of a “stolen moment” or of a “peek” of a couple in love from the distance. I thought that seeing a couple, from a distance on an old bridge, might suggest old world Italy. In order to create my concept, I needed a couple and an old bridge. Because of the very short timeline, I called my sister and asked if she and her husband were free the next day to be in a quick photoshoot. That evening I scouted all over Seattle to find an old bridge that we could use (many bridges in Seattle are fairly modern) and I found an old brick bridge over the road at the Arboretum not too far from the University of Washington. I met my sister Stephanie and her husband, Kendall, at the bridge during our lunch break the next day and photographed them from below. This was before digital cameras, so I went directly to get my film developed at a one-hour photo processor (Walgreen’s). Then I went back to my office with the photo prints in hand and scanned the best ones. Through Photoshop, I was able to tone down the color and make the photo appear older. I added a red rose linoleum block print pattern I had created to the edges, as well as an image of a handwritten love letter and a Starbucks postal ‘cancel’ stamp, overlaying the photo — all to evoke romance, love, old Italy, and the sending of love letters. This concept was approved (thankfully) very quickly and the stamp art was finessed and prepared for printing. The image lived on in a few various evolutions over the years, but it basically was the identity of Caffè Verona from 2001 into 2013, nearly 12 years! My sister and her husband appeared on stamps, coffee packaging, posters, and merchandise all over the world. My friends and family have enjoyed knowing the people in the Verona photo! People have wondered who they are and where the bridge is…it all started in Seattle, as a concept that got approved quickly and it has lived on. 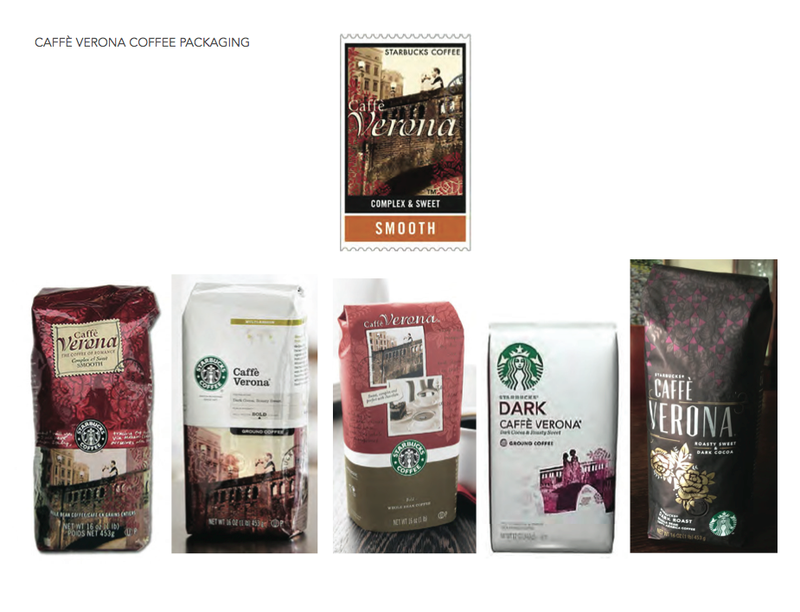 The current Verona packaging still has the rose pattern artwork, but everything else has evolved. In 2005, Starbucks acquired a bottled water company whose profits help fund clean water projects in developing countries. 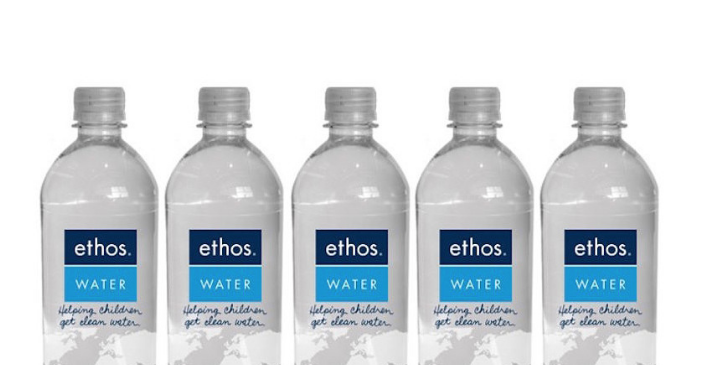 I became the brand designer for Ethos Water, developing a brand book, design guidelines and signage, including an updated tagline (“Helping Children Get Clean Water,” which is still my handwriting on the bottle). I had volunteered with a water organization that had benefitted from Ethos Water funds, so I already had experience with the cause and the brand. It was natural that I would work on Ethos Water projects inside Starbucks. With that water project organization, I had visited a small community in rural Honduras before they received funds to build a water system (the women and girls of the community were walking for hours every day to fetch water from dirty streams). Sickness, ill health and death were common from the contaminated water. Once Ethos Water became the bottled water sold in Starbucks stores, I was able to travel back to that village, with the founders of Ethos (Peter and Jonathan) and see, firsthand, how clean water (and toilets) near a family’s home could transform the health of these people so quickly. To see these people before and after their water project was truly life-changing and unusual. These water projects are life-giving and sustainable. What a joy to see for myself how something as simple as a bottle of water sold at Starbucks could make such a lasting difference for communities of people around the world. I was assigned to design a CD package for a Mother’s Day music compilation in 2011. The profits from this CD were earmarked to go to an organization called Every Mother Counts, which provides funding for improving maternal health and safe birth outcomes. I came up with a bunch of concepts that were vetted (and influenced) by several levels of decision-makers. We presented to the music team, and it was decided to do another round of concepts to meet the objectives more closely. The next day we heard that the founder of Every Mother Counts, Christy Turlington Burns, was scheduled to appear on the “Oprah” show in Chicago the following Monday. She wanted to show the cover of the CD, which was still in the concept stage! That night, from home, I came up with a bunch more sketches of ideas; as a new mother myself, I was totally moved and inspired by the songs that were to be on the CD. The next day, a direction was chosen and in order to meet the Monday deadline, I worked on the execution over the weekend (lots of painterly illustrations of the same sketch). As it turned out, everyone liked the “sketch” version of the idea better than the painted versions (I concurred – much fresher!). And due to a snowstorm that Monday, that episode with Christy Turlington Burns was rescheduled for later in the spring. But due to the quick turn-around, we arrived at the best solution much faster (with fewer decision-makers weighing in, which was better!). The CD was finished and sold in Starbucks stores for Mother’s Day – and it sold well. A few months later, we heard from Christy Turlington Burns that everyone thought that the sketch that appeared on the CD was the logo for Every Mother Counts – might they have permission from Starbucks to use that image for their logo? Starbucks agreed and that late night sketch continues to be the brand identity for their organization! 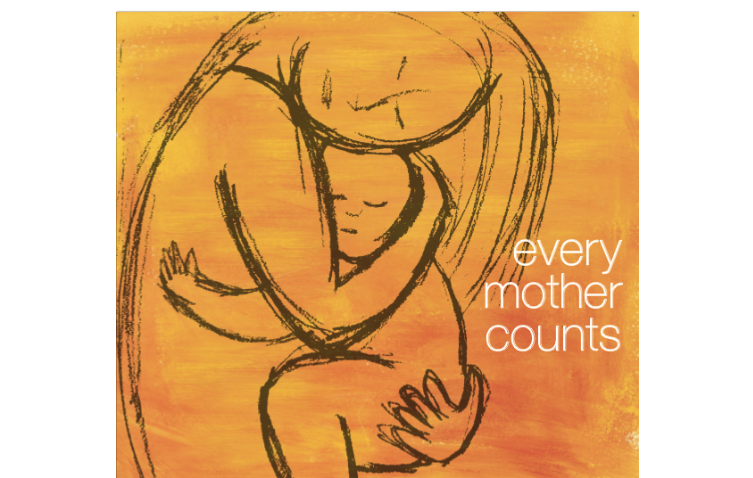 Just a few months ago, Christy emailed me to introduce me to her new brand manager who is compiling the history of Every Mother Counts and they want to include my story since my art became the first logo for their organization. How is the theme for the holiday cup determined? A team of designers and copywriters is assigned to the overall holiday campaign for creating concepts – taglines, themes, illustration style, colors, etc. This work usually starts 12-18 months in advance of the holiday time period. After months of revising and refining, a final concept is chosen and the various components move into the design phase. This is when the holiday cup is designed, to match the overall campaign concept – and many rounds of designs and reviews happen before the final designs are decided upon. Starbucks has kind of become this keeper of the cultural calendar — for a lot of people, the announcement of the PSL means that summer is ending and it’s time to welcome autumn. The arrival of the holiday cups now signals the impending season just as much as Black Friday sales and Hallmark Christmas movies. In your time at Starbucks, did the team feel a lot of pressure from this? Or did they relish the opportunity to constantly be designing something fresh and timely? I would say that we enjoyed the opportunity to come up with fresh concepts each year. The only difficulty was that we often started on holiday concepts in the spring, the exact opposite time of year to be inspired by Christmas themes! By rotating teams, the work continued to stay fresh, so a different group of designers would work on the fall campaign when PSL launches each year – it’s the same with holiday. However, I was assigned to work on many holiday promotions in a row. Sometimes I was assigned all of the in-store components, sometimes mainly merchandise and seasonal packaged foods. Whatever I was doing, I continued to enjoy participating in such an important season in the retail calendar. While we felt pressure to continue to create great work, we were always supported by very creative design managers who encouraged us to be as creative and bold as we could be. The pressure was more individual than from the outside culture as we were given great freedom to create. I remember sitting at my desk and nearly every day I thought to myself, “I love my job.” I said that for years! When Starbucks lost some of their design files in an earthquake in 2001, you were able to assist in the archiving efforts because you happened to have stashed away a set of cups. That would never be a problem today, as there are thousands upon thousands of pictures on the Internet of people taking selfies with their cups. When the birth of social media made Starbucks’ designs that much more visible, what kind of impact did that have on the design process? I think people remember me as the person who was a saver of samples and files, so when they were missing the cups from 1997, it was suggested that they contact me. It just so happened that I was the designer of those first holiday cups and indeed I had a whole set of the printed cups that I had saved! Regarding the design process, we designers had to be aware of what was happening culturally around Christmas and the holiday season, but we really focused on the theme of each year’s campaign more than what people were saying about the red cups. We tried to ignore some of the commentary about what things “meant” (in the symbols or design of the cups), as it’s difficult to predict what the social media noise might be. We tried to come up with authentic design that would celebrate the season within each year’s holiday promotion. Finally, are there any current trends in graphic design that you think are exciting and worth watching? I love seeing a renewed appreciation for great typography (evoking type design from the 1950s and 1960s, for example.) There’s great poster design now that is screen printed like in the 1970s. And book cover design seems to be more inspired and appreciated. Creative use of color is exciting, especially unexpected combinations. So is the use of halftones overlapping (looking a little vintage, a little modern at the same time). I think there’s more diversity in style and in execution that keeps design continually fresh. I’m grateful for such a creative career! You can learn more about Sandy and see her work at her website. Keep checking in with Branding Times for more news, trends, and insights from the world of branding and design!